« Newsflash! 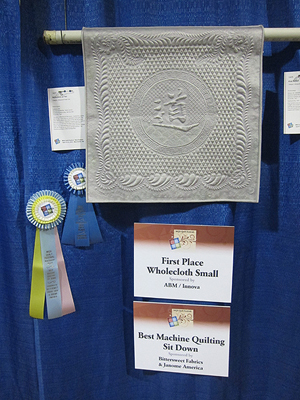 Five Bar Blues is a Winner at the Houston International Quilt Festival! Congratulations. I think that’s totally fantastic . First Welcome back to the blogging world! Sometimes we all need a break. Also Thank You for sharing the wonderful news! I wish I was able to see it in person. It is Beautiful! Thanks Helen, I appreciate your welcome! By the way – you can see other (and detail) photos of this quilt in earlier posts … just use the search box in the sidebar. Congratulations Diane! Your work is stunning! I was there and saw your fabulous quilt in person. It was one of my favorites of the show. Congratulations on the ribbons and I look forward to seeing more of your work at future shows. Thanks very much Michele. I look forward to exhibiting more of my work at future shows as well!